The Japanese American Cultural and Community Center’s “On the Veranda” series returns with Hinamatsuri (Girls’ Day) on Sunday, March 3, from 1 to 4 p.m. in the Garden Room of the JACCC, 244 S. San Pedro St. in Little Tokyo. Traditionally on March 3, Hinamatsuri is a special day celebrated by Japanese families to honor young girls and to pray for their future and happiness. 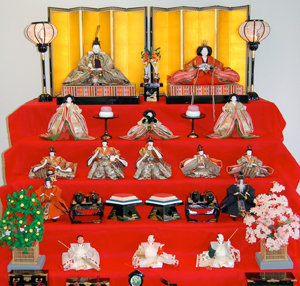 Hinamatsuri’s roots come from the ancient custom called hina-nagashi, or “doll floating,” in which people would float dolls down a river to carry away the bad spirits. Today, families with daughters display their heirloom dolls (hina-ningyo), representing the emperor, empress, and their attendants dressed in beautiful ancient Heian Period court costumes. On the day of Hinamatsuri, they celebrate with a party, including delicious treats that are “offered” to the dolls. JACCC’s Hinamatsuri features hands-on crafts, tea ceremony, a display of hina-ningyo, and a film screening. “Reiko’s Hina Dolls,” directed by Komaki Matsui, is the story of women who lived through the Japanese Canadian internment. This is the 10th year of the “On the Veranda” initiative, a series of lectures and demonstrations that explore Japanese cultural arts within the intimate setting of JACCC’s state-of-the-art Garden Room. The JACCC will continue to present informative and insightful lectures and workshops by trained masters. As space is limited, reservations are highly recommended. Admission is $10 general, free for JACCC members. For more information or for reservations, call Wakana Kimura at (213) 628-2725, ext.146.